In Iran's Religious Heartland, An Enduring Distrust Of The U.S. : Parallels In the city of Qom, ayatollahs and hardliners fret that their government relinquished too much in its nuclear deal with the U.S. and other world powers. "God knows what we gave up," says an ayatollah. 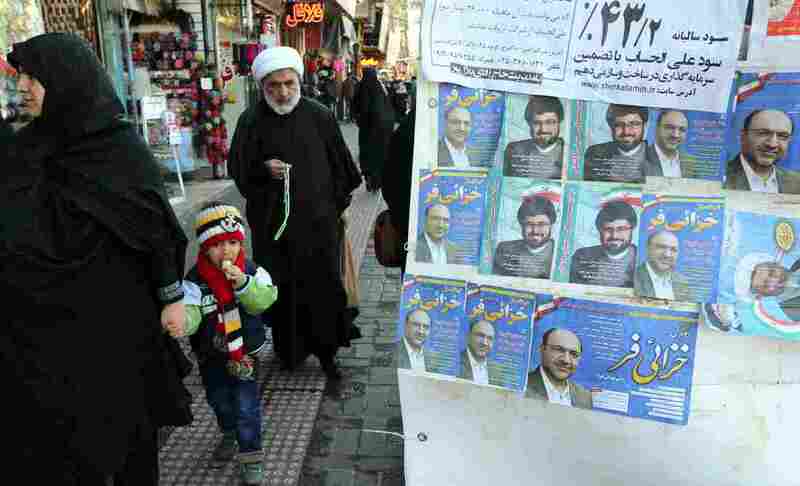 In Iran's Religious Heartland, An Enduring Distrust Of The U.S.
Iranians in Qom walk past electoral posters on Wednesday. Parliamentary elections are being held in Iran on Friday. Few people in Qom believe more engagement with the West is a good idea. Iranians vote on Friday for Parliament. The results could signal whether they are ready to engage more robustly with the West, following a deal with world powers aimed at preventing the country from developing nuclear weapons. Hardliners have effectively controlled the country's political system since Iran's revolution. But Hassan Rouhani, the current president, is considered a moderate and has worked to improve relations with the West. The election will be a crucial test of his agenda. In Qom, the religious center south of Tehran, very few people believe more engagement is a good idea. A funeral procession moves through an intricately tiled arch at a holy shrine as a cold morning rain comes down. Here, honoring the dead, especially martyrs killed by Iran's enemies, is as natural as breathing. Students of all ages interested in the study of Shiite Islam come to Qom from all over the world. As you may have guessed, Qom is also a very politically conservative place. 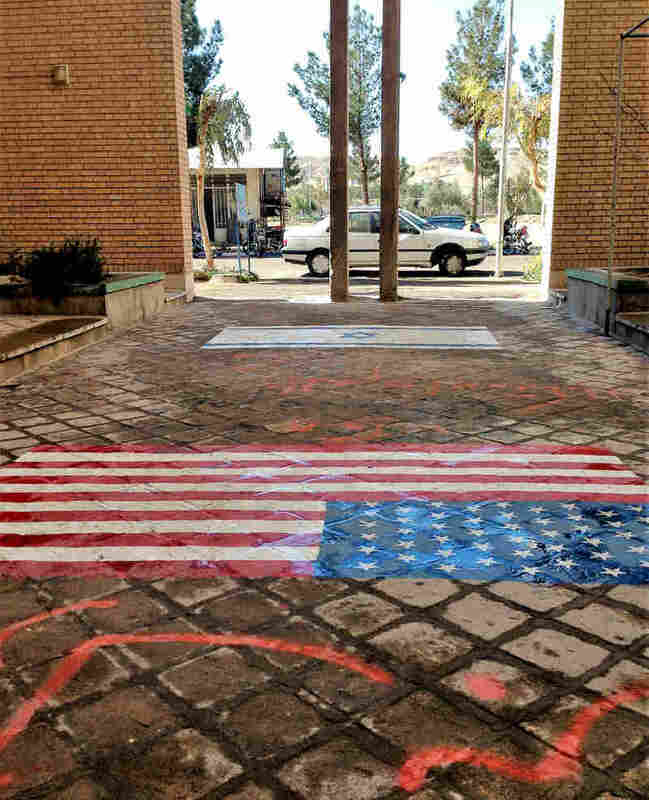 At a modest religious school named for a martyred ayatollah, depictions of the U.S. and Israeli flags are painted on the entrance floor so students can walk on them. The noon call to prayer is not recorded and blasted out over a loudspeaker, a common practice these days. Instead, a slender young man fills the courtyard with his unamplified voice, as students shuffle past. One of the worshipers is 20-year-old Ali Hajizadeh. He says the nuclear deal is enough engagement with the West for now. "Of course we had the nuclear agreement," he says. 'The whole world witnessed that we extended our hand in friendship. But as the supreme leader has said, we cannot solve problems with countries we don't trust." That view is echoed by Ayatollah Ismail Pourvahab, the polite, reserved director of the school, whose beard is showing some gray. 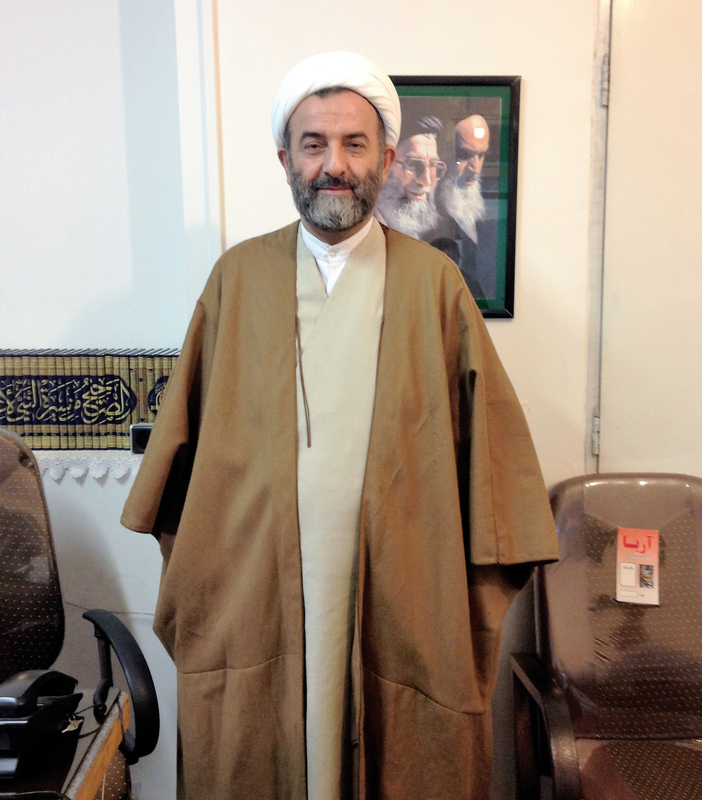 Ayatollah Ismail Pourvahab, in his office at a religious school in Qom, is deeply critical of Iran's nuclear deal with the west. He says if Americans want Iranians to stop burning U.S. flags, they can "pay compensation for all the oppression" they're responsible for. "God only knows what we gave up," he says. "We had 19,000 centrifuges. We reduced them to 6,000. Fordow nuclear facility was our eyes, it was our reputation. Enriched uranium, up to 20 percent, and we needed [it] in medical facilities — and we gave it up. Despite all these good gestures, we see that every single day, the Congress of the United States of America, they are constantly speaking of imposing other sanctions." Pourvahab seems to know an awful lot about the nuclear accord, but then again, Fordow, the underground nuclear site now being converted for research, is just 20 miles away. Pourvahab sounds a bit like Secretary of State John Kerry when he says the deal boils down to major cuts in Iran's nuclear program in return for limited sanctions relief. The person Pourvahab does not sound like — at all — is his own country's foreign minister, Mohammad Javad-Zarif, who has called the deal a "win-win" solution for diplomacy and mutual respect. Pourvahab lists a host of reasons why not to engage with the U.S., going back to Washington's support for the Shah's dictatorship and continuing up to today. "Who is causing trouble in Bahrain, Yemen, Afghanistan?" he says. "Saudi airplanes are constantly bombing Yemen. Where are these bombs, missiles coming from? All of these come with the support of the U.S. So long as there is no change in this behavior, there is no hope that things will change." This argument ignores Iran's own support for listed terrorist groups such as Hezbollah and Hamas. It's also not a majority view, Iranians say. But a visit to Qom does give a Westerner a glimpse of the forces that will be lining up against Iran's moderate and reformist politicians in Friday's vote.